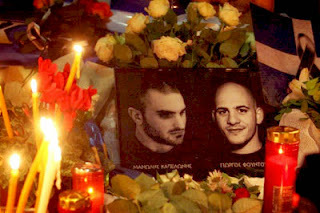 Police authorities released one of the videos they have with footage of the shooting at the Golden Dawn party offices in Neo Heraklio last Friday where two party members got assassinated. A third member was also shot, and is currently in critical condition. The film shows the two men involved in the attack approaching the offices, shooting two men dead and injuring a third, before running off. Authorities released the video to encourage more witnesses to come forward. If anyone has any information about the shootings they should immediately call 1014 or 10414 or e-mail the Greek police on ctu@hellenicpolice.gr. All information can be given anonymously.